You don't really need me to tell you that Rod Hull & Emu were very well-known in the UK during the 70s and 80s. Invite Emu on to your TV show and you were asking for a whole load of trouble. This page is dedicated to the late Rod Hull and that troublesome bird. Probably the most classic clip is when Emu attacks Michael Parkinson which you'll find further down the page. Rod died on 17th March 1999 after falling from his bungalow roof while trying to adjust the TV aerial. In the early days of TV darts show Bullseye, a celebrity would throw darts for charity and the professional players would throw the following week and so on. Here is Carol Lee Scott (aka Grotbags) from Emu's Pink Windmill Show throwing the darts! Carol sadly passed away in June 2017 aged 74. Emu's All Live Pink Windmill Show was an anarchic children's tv series that ran in the 80's. 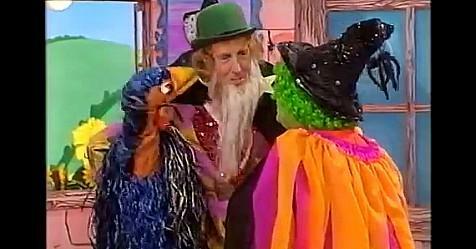 Every week Grotbags (the green witch) threatened and tried to steal Rod Hull's crazy puppet Emu so that once captured she would be able to use its "special powers" to control all the "brats" in the world. Emu's All Live Pink Windmill Show was the follow-up to Emu's World, and was replaced by a pre-recorded show in 1986. The Rudi Carrell Show was shown on Dutch and German television from the 1960s to the 1990s. In this clip, we see Emu really getting aggressive! 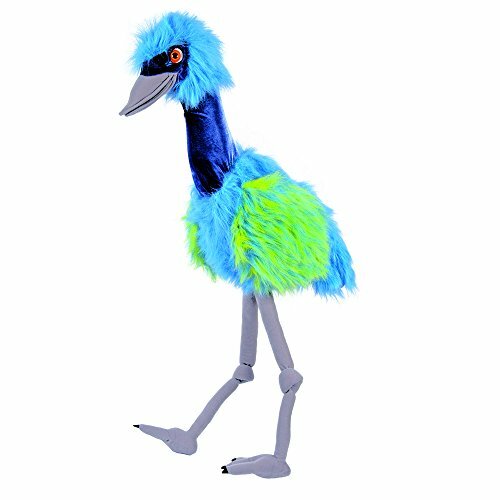 This was Rod Hull's first children's TV show with Emu and was aired between 1975 and 1980 on BBC1. 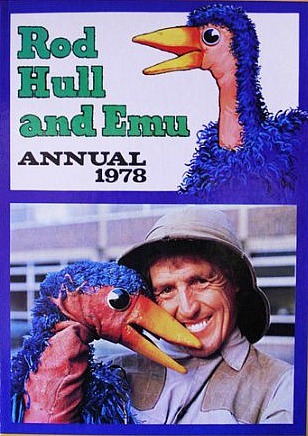 In 1981, Hull and his violent bird moved to ITV to start a new show called Emu's World. This was produced by Central Independent Television and aired from 1982 to 1988. During this period, the duo still worked for the BBC on several shows including one-off Christmas and Easter Specials in 1981 and 1982. Also, Rod And Emu's Saturday Specials aired for one series and featured six episodes in January and February of 1983. The Rod Hull And Emu Show in 1984 lasted for just the one series. This clip features Grotbags having a hissy fit. After watching this again for the first time since the 80s, I've suddenly realised how camp the Tin Man was! And you have to feel sorry for Croc, don't you? I mean, that costume is awful! This kids teatime show started out as Emu's World before becoming Emu's All Live Pink Windmill Show which went out live (obviously!) and ran for two series. The show eventually became Emu's Pink Windmill Show which was pre-recorded and was shown for one series in 1986. The show's title changed to Emu's Wide World in 1987 and ran for two series before being cancelled in 1988. In 1989, one series of EMU TV was aired for one series on ITV and used a similar format to Emu's Broadcasting Company shown on the BBC in the late 70s. We'll leave you with this infamous clip where Michael Parkinson is attacked by Emy on his 1970s talk show. Emu's Pink Windmill Show featured Rod Hull, Emu, Grotbags and her servant Croc.